The practice of accounting is an important one with varied requirements for certification and expectations depending upon which state you live in. 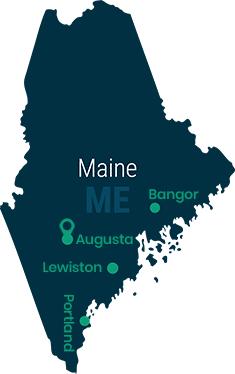 Maine is no exception, and has their own set of standards for reaching the highest level of accounting licensure, the CPA. First, you’ll need to find and enroll in an accounting program at an accredited college or university. The Maine Board of Accountancy only accepts degrees from schools that are accredited by an accrediting agency in good standing with the Council of Postsecondary Accreditation. If you’ve already enrolled in a program, confirm that it’s accredited by one of these agencies. If your educational institute is outside of the United States, you will need to send your transcripts to the Foreign Academic Credential Service FACS). The Maine Board of Accountancy will then evaluate the results and determine if you meet the state education requirements. Credits earned at a regionally accredited community college or two-year degree granting institutions are acceptable. Correspondence and online degrees are acceptable, as long as the university is accredited. Credits by examination are acceptable. If you have questions regarding the standing of your current institution or one you’re considering applying to, contact the board. In order to qualify to sit for the Uniform CPA Examination, you must complete at least 120 semester hours of the 150 hour requirement, including the basic courses in accounting and auditing, as well as 15 semester hours in one or more of the topic areas mentioned above. You’ll also be required to attain your 4-year baccalaureate or higher degree within 120 days following your first examination. Failing to graduate within this time period will mean no credit will be given for the examination and you’ll be unable to request your exam scores. Examination fee of $208.40 for each section you intend to take: Auditing and Attestation, Business Environment and Concepts, Financial Accounting and Reporting, and/or Regulation. You can apply for as many examination sections as you want. Official school transcripts from all schools listed on your application. These must be sent directly from your school to CPAES. Three reference letters submitted by you or your references, which may not include anyone related to you. Additionally, only one letter may be written by an employer or educator who knows you solely through work or school. Certification of Enrollment, if still enrolled, submitted by you or your institution. This may not be necessary if courses in progress are listed on your official transcript(s). Final transcripts signifying the completion of your program must be submitted to CPAES within 120 days of your first examination. International Evaluation, if education was received outside of the United States. This must be sent directly from your evaluation agency. Testing Accommodation Request Form, if applicable, submitted by you. Supporting legal documents (if applicable for background check purposes). Keep in mind that application and/or examination fees are not refundable. Under extreme circumstances, however, you may request a testing extension or a partial refund for examination fees using an Exception to Policy Form. You should receive an email once your materials have been received. If you fail to submit any required documentation with 45 days, your application will be marked incomplete. On average, it will take between two and four weeks for your application to be processed from that point. Once the NASBA determines you’re eligible, you’ll receive a Notice to Schedule (NTS). Your NTS will instruct you on how to schedule your exam date via Prometric. Be advised that Prometric does charge exam service fees. Your exam responses will be sent to AICPA to be tabulated. You should then receive the results via postal mail. Your work experience must be confirmed by a licensed CPA. Make sure you use the appropriate verification form for either CPAs licensed in Maine or CPAs licensed in another location. A total fee of $76 must also be included. This can be paid online, via check made payable to “Maine State Treasurer,” or by including your credit card information on your printed application.